The three pregnant does we’ve seen this season produced two pairs of twins and one set of triplets. That’s just for the does crossing our yard; we’ve seen many others around the area. The fawns are, of course, insufferably cute, but the deer have eaten everything growing on the forest floor, eaten all the tree leaves within reach, and are now working on vegetation that deer don’t normally eat. Such as, for example, Mary’s long-suffering kiwi plants by the garden and various distasteful flowers in front of the house. One doe maimed her starboard foreleg in an automobile collision; she was hobbling around for about a week before vanishing. Fawns, who don’t come out of the oven knowing that automobiles make fearsome predators, tend to die young; three of the seven have died on the road within walking distance of the house in the last two months. We recently heard a sharp bang! bang! out front, shortly followed by a police car accelerating along the road. It turns out the officer dispatched this fawn with two shots below the left ear; I think they carry a special .22 caliber gun for this very purpose. 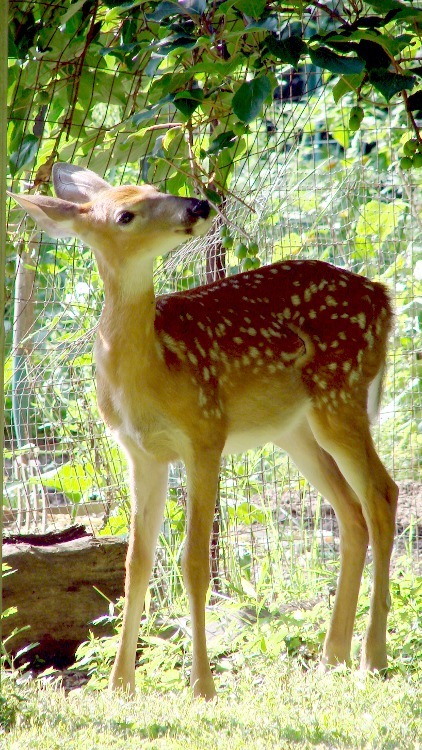 No, the fawn wasn’t standing around waiting to be shot; it had just starred in Yet Another car-on-deer collision. This, according to the local deer huggers, is a much more desirable outcome than harvesting surplus deer and eating them. 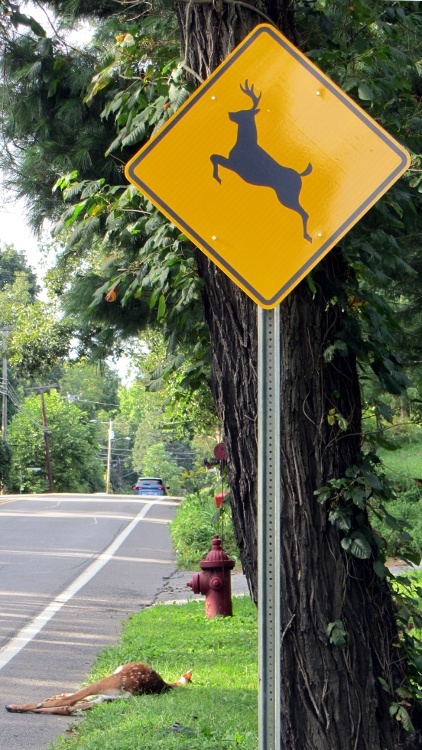 I haven’t noticed any deer huggers volunteering to pay for damages; that seems to be an externality to them. A billboard up the road demonstrates their total lack of comprehension: a pastoral scene showing a buck (with a full rack) nuzzling a fawn. Pop quiz: who wrote that book? Bonus: how much interest do actual bucks display in their offspring at any time? A previous rant on this subject is there.